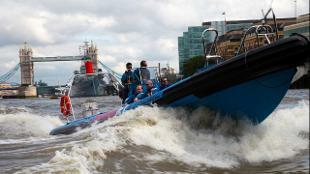 Your experience starts as we cruise past some of London's most iconic sights. Sit back and enjoy the view of some of the capital's greatest bridges, including the world-renowned Tower Bridge, on the way to the fast zone. In fact, you need to stay alert because the sights really do come thick and fast on this stretch of the river. After passing Tower Bridge, we are heading for speed, during the only jet boat ride which stops harder and turns tighter than anything else on the river. Our experienced skippers really know how to put our military grade boats through their paces, so hold on tight for the aquabatic ride of your life! 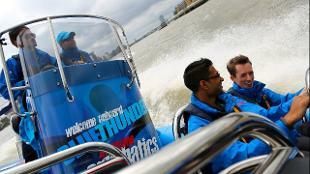 Children under the age of nine years and/or of less than 25kgs in weight are not eligible to travel on Thamesjet. Children under the age of 16 years must be accompanied by an adult. 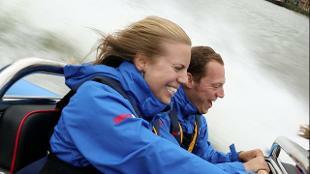 For our opening times and seasonal information please check our website www.thamesjet.com .